aerial photographer, and a fighter pilot engaged in some of the deadliest air battles the world had ever known. The odds of surviving these almost-daily encounters were somewhere between slim and none. Yet, by some miracle, many of these brave and courageous airmen lived through the horrific campaigns and returned home as conquering heroes. 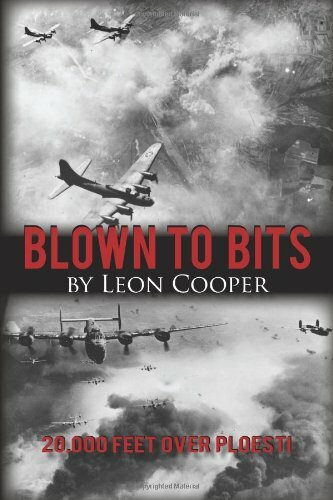 Blown to Bits: 20,000 Feet over Ploesti shares the story of these two dozen American aviators who were shot out of the skies over Nazi-occupied Europe. Considerable material was extracted from national archives in order to document the individual accounts. Author Leon Cooper traveled across the country to interview the remaining survivors and also communicated with family members of the others, who provided a wealth of photos, documents, and stories. Discover an amazing chapter in American history through the firsthand accounts of the men who lived through these harrowing events. Their story is intriguing, tragic, and exciting, but the ending is nothing less than miraculous!